Gday guys, I was travelling into the Cultural centre here in brisbane from the southside to catch my bus home when I stumbled upon this nice bus jam (below) An ambulance was blocking the southbound lane (platform one) for approximately 10 minutes at around 5.10pm It appeared a passenger has had a medical problem and needed to be taken by ambulance to the hospital (what I don't know.) There were a couple of Police and Busway staff trying to explain the situation. 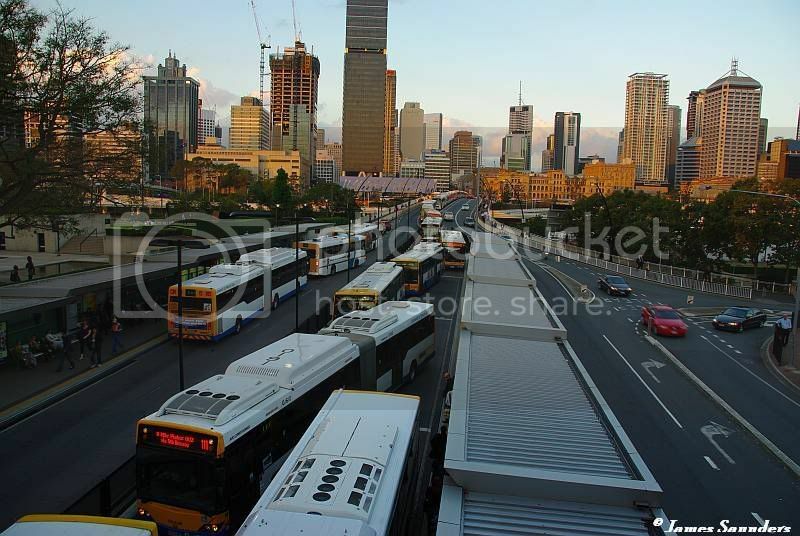 The bus jam went of the Victoria Bridge and down in the Queen Street Bus Station. As I went past on my 330 I could see quite a few frustrated passengers and drivers. 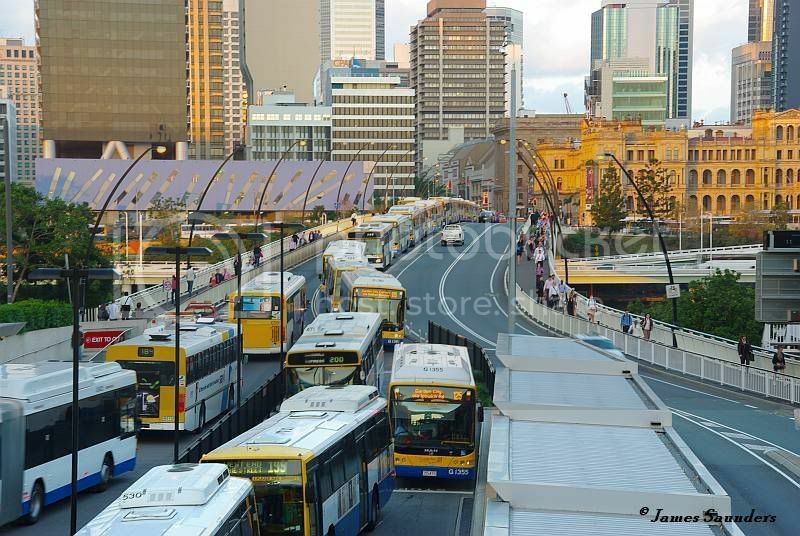 That last time I saw a bus jam that big was when the Riverside Expressway was closed and all buses were jammed into the cultural centre. One must wonder.... How many of those drivers Actually went on to the normal road beside? There looks to be a gutter, which probally wouldnt be good for the buses if they went over it. At a stretch a bus could mount the gutter and use the roadway, but the driver would probably get in trouble for it! The ambulance was only there for 10-12 minutes, but i'd say the effects of the bus jam continued well into the night. 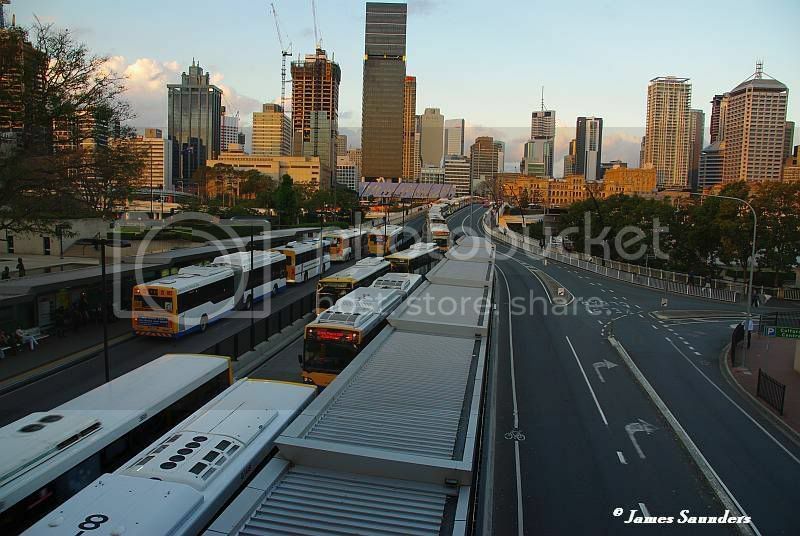 Some good pics there V761, this stretch of busway would have to be one of Australia's busiest even without problems. I do hope the person requiring medical assistance was ok.
Congestion appeared to have cleared a lot by the time I'd caught my northside bus from the Cultural Centre after 6ish. Got a nice pic of the rear of my bus in the second pic ! In the third pic, I am the one behind the artic who I just let out .. When I joined the bus jam, the queue was only 3/4 across the bridge. By the time I got past the Cultural Centre, the queue was backed up through the QSBS and KGS.. I beleive the incident originally happened on North Quay on the bus lane entering the Victoria Bridge. An injured person was transported in a bus to the Cultural centre to allow other buses to pass. BT-Otto what bus are you talking about? V761 wrote: BT-Otto what bus are you talking about? 530 ... I feel sorry for the passengers who caught my bus instead of waiting an extra 5 minutes for the express which uses the freeway..
You didn't happen to notice me up above did you? I did notice someone as I had looked up to see where the guys who announce the arriving buses where. Nothing was being said on the PA system that I could hear.. There was no one on the PA as I think they were down on the platform sorting the problem out. Is this the new Central City Depot i've heard about? Plenty of parking area as well. And they say buses can manoeuvre around blockages because they are buses. 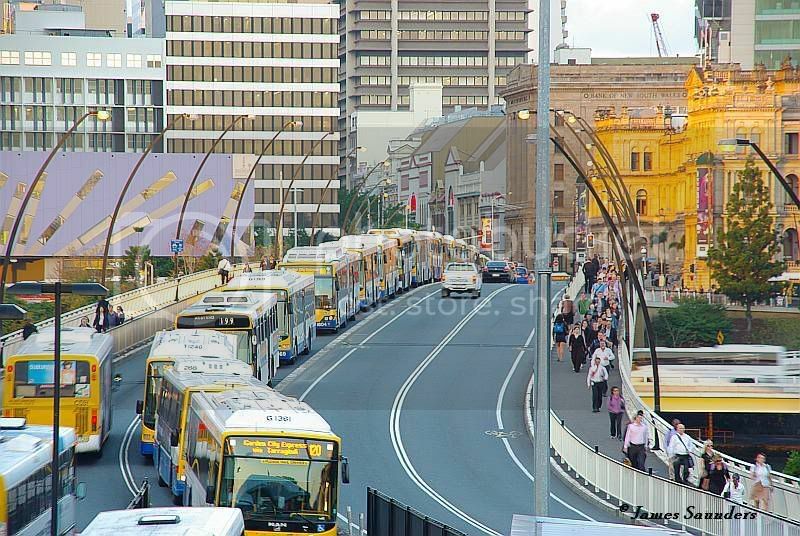 Bring on the trams for Brisbane. V761 wrote: At a stretch a bus could mount the gutter and use the roadway, but the driver would probably get in trouble for it! I'd say you're wrong as most of the queue was cleared out of QSBS before 6pm (I left around 545 over Captain Cook Bridge thankfully ). There's no point going on the normal roadway either. You can't stop at cultural centre. It's dangerous enough to turn left into the Melbourne St portal as it is, let alone from the car lane. You'd be lucky to get across the inbound car lane in peak hour as it usually banks up back across the whole bridge. It is possible to clear a backlog over the course of an hour or so (depending on the situation) assuming nothing else goes wrong. If the buses bunched up, you'd get the frequent services going pretty close together so the first bus would cop as many as could cram in and the second bus might be able to sail straight by. Again it comes down to alot of different variables. I'll tell you now though in a situation like that in peak hour, you thank your lucky stars that Cultural Centre is a Pre-paid platform outbound. Is that the truth or did you read about it in a Rail Back on Track media release? Great shots James, very sharp and clear for low light. A rare opportunity to capture such chaos caused by just one person. Andrew21, I agree that no buses would actually do it, but *if* they had to they could probably get over that gutter. I did see some buses that were going around into Grey st to begin a Northbound service were using the regular lane. First of all, I'd like to apologize for posting in an older forum, but I really feel the need to comment. So here's my comment: Holy COW! I'm not from Australia (I've visited before) and in all the times I've taken public transit, I've never seen the streets this packed with traffic. So crazy! I was casually looking up photos of Australian public transit (to show my sister, who plans on visiting) and these images just happened to be ones good ol' Google gave me. LOL. Still, this is nuts. It looks like mid-day Los Angeles or Manhattan (NYC). Anyway, I thought the photos were pretty cool. Although I would hate to have some place to be on time in that traffic. I guess us travelers should be cautious of where we decide to go and when. Thanks for letting me gab, guys!